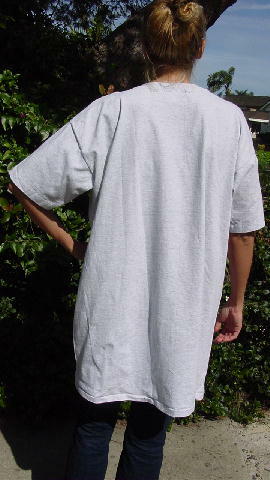 This very large one size fits all light gray long T shirt is by Flirts and is 100% cotton. The back has no pictures or writing on it. 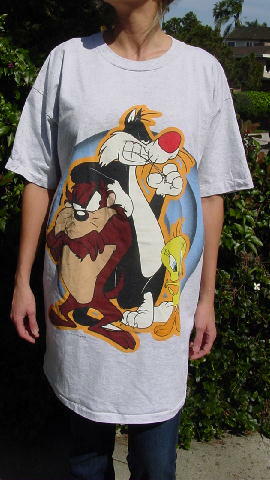 On the front are Taz, Sylvester the Cat, and Tweety Bird standing in front of several multi-tone blue and black dotted circles. Below the figures it says TM and © 1993 Warner Bros.
She got it as a gift when she was younger. She wore it several times as a nightshirt. shoulder to end of sleeve 8 1/4"
shoulder to hem 34 1/4"
armpit to armpit 26 1/4"